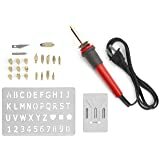 ?Wood burning kit with temperature control and switch? 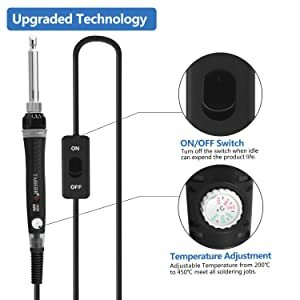 With the ON/OFF switch on the woodburning pen, you can use it with safety and energy saving, the adjustable temperature control range from 200? 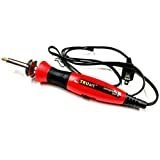 to 450?, which make the pyrography pen can use at any surfaces and project..
?Advanced heating and cooling technology? 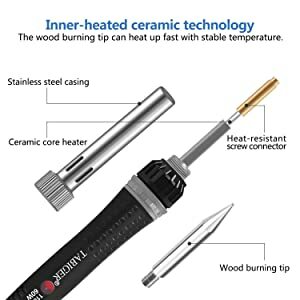 With inner-heated ceramic technology, the wood burning tip can heat up fast with stable temperature, which greatly improves work efficiency and energy saving, when you need to change the tips, the four ventilation holes on the wood burning pen provide better heat dissipation, so you don't need to wait long for the cooling..
?Meet various artistic creation needs? 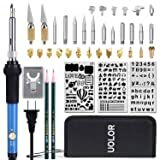 The 5PCS Carving/Embossing/Soldering Tips of this woodburning kit, allow you to create a variety of designs on many surfaces with your own creativity..
?Widely used wood burning kit? 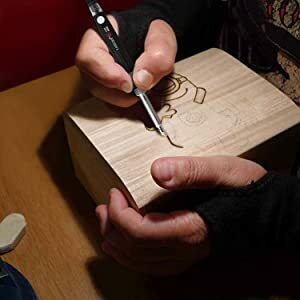 With this wood burning kit, you can do pyrography on rod grips, carve foam pumpkins, engrave kitchen table, decorate wooden spoons, burn wooden plaque, stipple handgun grips, cut heavy duty nylon fabric and so on, it is a ideal tool for any hobbyist..
?What you get? 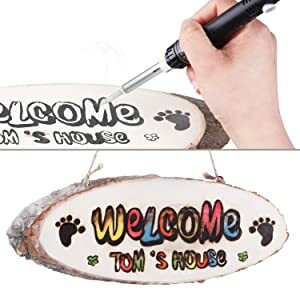 1 Wood burning pens, 5PCS Wood burning tips, 1 set woodburning stand&sponge, 1 Instruction manual, 12-month warranty and friendly customer service..
Este producto fue vendido por última vez el 17/12/2018, 06:17 p.m.
Tabiger Wood burning set, 60W Wood Burning Pen with Adjustable temperature 200-450?,ON/OFF Switch and LED indicator, all the accessories you needed are included. 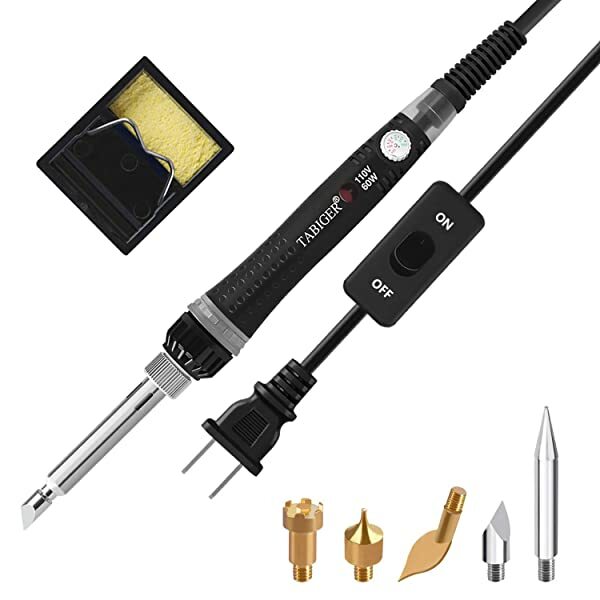 The body of the pyrography pen is made of high quality silicone material, which can endure high temperature, it is also anti-slip and heat-resistant, make it comfortable and safe to use. 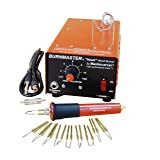 The adjustable temperature and different tips make this woodburning kit suitable on cork, leather, even wax candles, woods such as beech, sycamore, birch or hornbeam. 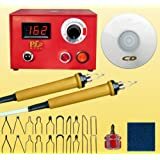 soft plastic, synthetic fabrics, wax, cork, hard plastic, natural fabrics, paper, stencil material,ceramics, foam core board, foam pumpkins and plastic foam. 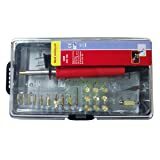 6, Keep some pliers nearby and use them to tighten your tips when needed, as you work. 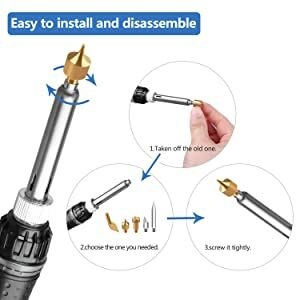 Be sure not to over-tighten since they can break while hot.